Think has started distributing the City in Switzerland, France and Spain. The first deliveries of the car to the U.S. fleet market start in December. Tiny Norwegian electric car maker Think Global AS is trying to turn its biggest weakness into a strength. “The real opportunity for us is to accelerate our capabilities on the sales and distribution front,” new Think CEO Barry Engle said in a phone interview. 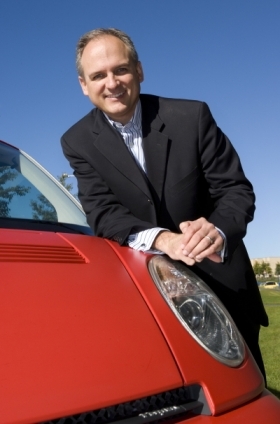 Engle, a former Fiat Group and Ford Motor Co. executive, became Think's third CEO in September when the U.S. native succeeded Richard Canny, who is now vice chairman of Think North America. CEO Barry Engle aims to build a brand around Think's so-called "city-ness." Engle says Think has a well-established product in the City minicar, which customers have driven a combined 56 million kilometers (35 million miles) since the car first appeared in 1999, it also has plenty of production capacity because of partnership with Finnish contract manufacturer Valmet Automotive and its soon-to-open U.S. factory in Elkhart, Indiana. Now the company wants to use those strengths to “build a brand that marries up with the distribution channel,” Engle said. The man in charge of doing this is Michael Lock, a British national who spent seven years as CEO of premium Italian motorcycle maker Ducati's North American operations before starting as Think's chief marketing officer in August. "What was immature in the business was taking the product out to the market place," Lock said in a phone interview. "It's not because people were sitting around here doing nothing. There really wasn't a marketplace. That has changed this year as a number of countries have stepped up and are putting in infrastructures and incentives." Markets that have or will have incentives on electric cars include the UK, Spain, France, Portugal and Ireland, where the subsidy is 5,000 euros. "We can take EV to where it is most wanted, which is in big, congested, polluted cities,” said Michael Lock, Think's chief marketing officer. A current example of this push is Think's decision to market the City in a dedicated electric mobility concept store in Zurich, Switzerland. The so-called "m-way" store was specially created and designed by Swiss retail giant Migros AG, which is Think's distribution partner in Switzerland. The City is available for lease or sale at m-way. Think says it will replicate the Swiss model in cities around the world as it accelerates its global expansion. Engle said that the design of the City, which is compact and has plastic body panels that can take the bumps and bruises that are a part of urban driving, and the car's range, 160km (about 100 miles), make it perfect for cities. Another one of Lock's jobs is to reduce the company's reliance on Norway, which accounts for a third to 40 percent of the brand's sales. Think sells the City for about 32,000 euros (about $43,800) after incentives in Norway. The car's starting price in Switzerland is 35,000 francs (about $35,570). When asked whether 30,000 euros is the target, Lock said the price point is changing on a monthly basis as competitors such as the Nissan Leaf and Mitsubishi iMiEV enter the market. The i-MiEV and Leaf will cost a little less than 30,000 euros with incentives when sales start. 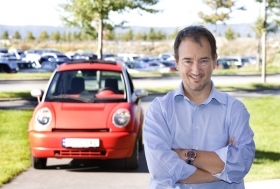 The i-MiEV debuts in Europe before the end of the year and the Leaf arrives in early 2011.